The seven-minute video shows the jihadists vandalizing the ancient reliefs in Nimrud, an area that is held by militants. They also used sledgehammers and drills to bring down some of the walls and ultimately levelled the whole complex with explosives. The video follows a statement made by Iraq's Ministry of Tourism and Antiquities in March. It said Nimrud, a UNESCO cultural heritage site with archaeological riches dating back to the 13th century BC, was bulldozed with heavy machinery. RT could not verify the footage. On Sunday, an Iraqi Antiquities Ministry official, speaking on the condition of anonymity, told AP that all items at the cultural site were authentic. The jihadists have previously said they consider the artifacts to be idolatry. The militants, who have created a self-proclaimed caliphate in northern Iraq and parts of Syria, have been waging a campaign to obliterate cultural sites and relics, which do not fall in line with their ideology. 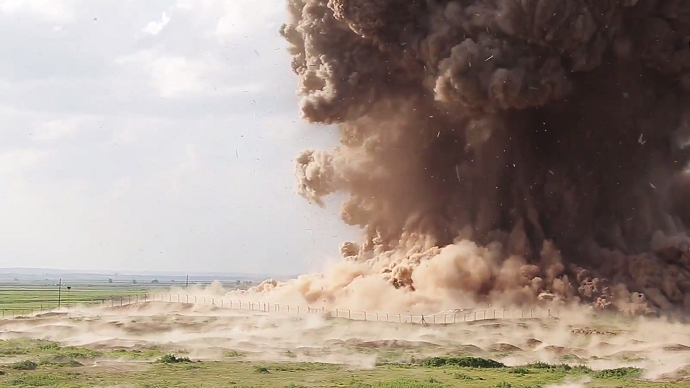 Another video released in April, shows the Islamic State (IS) destroying the 2,000-year-old ruins in the ancient Hatra city in northern Iraq, 110 kilometres south of Mosul. The jihadists obliterated ancient artifacts in the Mosul Museum in February, while they also blew up the Mosul Public Library, using homemade bombs. The Central Library of Mosul was not spared either. IS militants burned all the books and left only Islamic publications. In March, the UN cultural agency's chief, Irina Bokova, slammed the destruction of Nimrud, saying that it amounted to a war crime. The city of Nimrud located on the Tigris River was founded in the 13th century BC. It was part of the Assyrian empire, which occupied territory from the Mediterranean to the Caspian Sea. Its treasures were discovered by archaeologists in the 20th century and are considered to be one of the most notable finds during that period. Though, most of the priceless artifacts have been moved to museums in Mosul, Baghdad, Paris and London, the giant statues of lamassu – an Assyrian deity depicted with a bull or lion's body, eagle's wings and human heads – remained on site. Several campaigns have been launched in protest the horrific destruction of Iraq’s cultural heritage. One was initiated by the Pushkin State Museum of Fine Arts in Moscow. In March the museum launched the hashtag #savetheshedu, which invited people to take a photograph of the shedu on display in the museum. In Sumerian and Akkadian mythology, a shedu is protective spirit. It was depicted as a creature with five-legs, the body of a bull, wings of an eagle and head of a human. It was placed at the entrances of palaces and at the gates of ancient Mesopotamian cities. "This is a huge loss not just for them but for all of humanity. If we cannot respect our common history, then we have no hope," Anastasia Yainovskaya from the Department of the Ancient East at the Pushkin Museum told the Moscow Times.